The lion isn't king of the jungle for nothing: Once he's fully grown, the only predator he faces is human. Reaching up to 500 pounds and living in prides of approximately 15 to 30 lions, no other animals are in the position to take on this guy and win. African lions are magnificent big catsw, found mainly in the plains of East Africa and western Africa south of the Sahara. They're social, living life in prides according to a distinct hierarchy. Up to three males patrol and protect a territory while females hunt and tend to cubs. Working together, lions can take down zebras, buffaloes, young elephants, giraffes, hippos and rhinos. They'll also feed on antelopes, lizards, mice and scavenged food. Hyenas will sometimes fight lions for food but will usually lose out to the bigger, stronger lions. Though he's at the top of his food chain, the African lion has become endangered because of him. 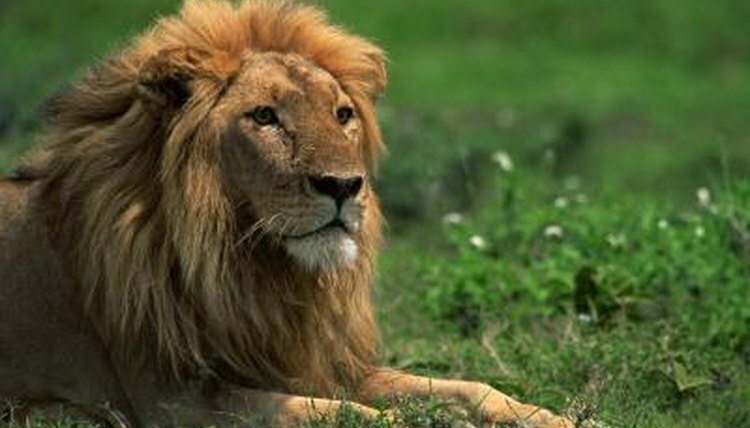 Since 1980, the lion population has declined 50 percent. Humans prize the lion for his trophy status, making him a target for big game hunters. Farmers also kill lions to protect their livestock from the big cat's predatory nature. When a male lion is killed, the pride is often taken over by a nomad lion who will kill the cubs -- which adds to the lion's declining numbers.